Verdi’s Simon Boccanegra in its revised 1881 version was staged by Parma’s Teatro Reggio in March of 2010. Verdi’s gloomy masterpieces is a specialized taste, the Met did not get to it until 1932 and has only done it 139 times. It’s libretto is awkwardly constructed and sometimes almost impossible to follow. For example, why does Amelia not tell her lover (Gabriele Adorno) who thinks Simon is his rival for her affections that he is her father? Adorno keeps threatening to kill Simon, yet Amelia stays mum about her paternity. Adorno doesn’t learn the truth until Boccanegra tells him. She’s at the top of the list of opera’s stupidest sopranos – a real achievement considering the competition. Her grandfather (Fiesco) has lived with her for 25 years and hasn’t figured out that she’s his granddaughter. It takes Simon three minutes to discover the truth of her ancestry. So Fiesco is a dunce bass with an IQ similar to that of Amelia. The opera is structurally imbalanced. Its high point is the council chamber scene which Verdi and Boito added to their 1881 revision. It’s one of Verdi’s greatest achievements, but it comes at the end of Act 1 making the remaining two acts seem anticlimactic. 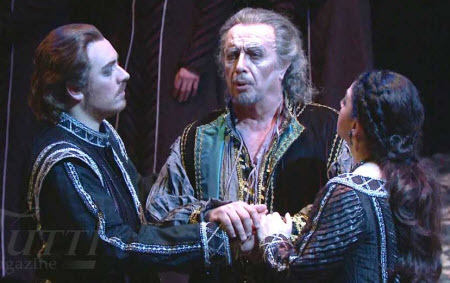 Nevertheless, Boccanegra is a blemished pearl. With the right cast it is a moving and beautiful work. The Parma company had just about an ideal cast in its 2010 production given as part of its series of the master’s complete operas. The title role is one of Verdi’s great gifts to the baritone. The opera cannot work without a great singer as the nobel and beleaguered Doge of Genoa. Leo Nucci (born 1942) looks older than sin, yet his voice is fresh and powerful. He is still singing Verdi’s major baritone roles at some of the world’s major houses at age 74 – remarkable! He’s got Rigoletto and Simon Boccanegra coming up this year at La Scala. Thus he was a youthful 68 when this performance was recorded in 2010. Vocally his interpretation of Simon is about as good as it can be. Here is Simon’s great pleas for peace and understanding and the ensemble that follows it from Act 1. Of course, in opera as in real life it’s ignored. Plebi!Patrizi! The hardest part in the opera to cast, outside the title role, is the tenor, Gabriele Adorno. Most of his music is set high and in the tenor’s passaggio. This vocal placement is best illustrated by the Act 2 aria Sento avvampar nell’anima . The young Italian Francesco Meli (born 1980) gives a splendid reading of the aria. Though he started out singing bel canto roles he has developed into a spinto ready for the great Verdi tenor parts. He has a beautiful sound and sings with expression and vocal control. He has sung 11 times at the Met as the Duke in Rigoletto and in the title role of Ernani. If he can sustain the level of excellence that he showed in this run of Boccanegra he should have a major international career. The Georgian soprano Tamar Iveri was the dimwitted Amelia. She has a rich voice that was up to all the demands Verdi made on this character. If there’s any criticism it’s that she doesn’t project a lot of personality. Still, hers is a first rate voice. The veteran bass Roberto Scandiuzzi was the aggrieved nobleman Fiesco. His lyric bass was well produced and his acting fine. The villain of the opera, Paolo, was sung by Simone Piazzola. This part is one of the best secondary roles in opera and Piazzola made the most of it. His virile baritone sounds like he could easily do the title role. The remainder of the cast were all first rate as was the chorus. Daniele Callegari conducted well, but a little more fire from the orchestra was called for. He did support the singers very well. The staging was, as is typical of the Parma theater, conventional and period appropriate. Which is just what this opera needs. It made effective use of the relatively small stage showing that a gigantic platform is not essential for the mounting of a big Verdi opera. The costumes were good. My only cavil was the wigs which all the male principals wore. They looked like they had been rescued from an attic filled with old Halloween outfits. They were all terrible, but the worst was that worn by Meli, who looked like he belonged in a Star Wars outtake. He’s young and good looking. The makeup department at Parma should have left him alone. In summary, this is an excellent performance of Verdi’s flawed masterpiece. If you want a video of this opera, this one is hard to beat. Highly recommended. This is a favorite Verdi of mine. No hit tunes but lots of character. At first, like you, I saw the dubious plot absurdities, but once I got past that I was drawn in to this man’s soul. Also, Fiesco was kept strong thru hate, and when the reason for it disappeared, he becomes instantly a week old man.